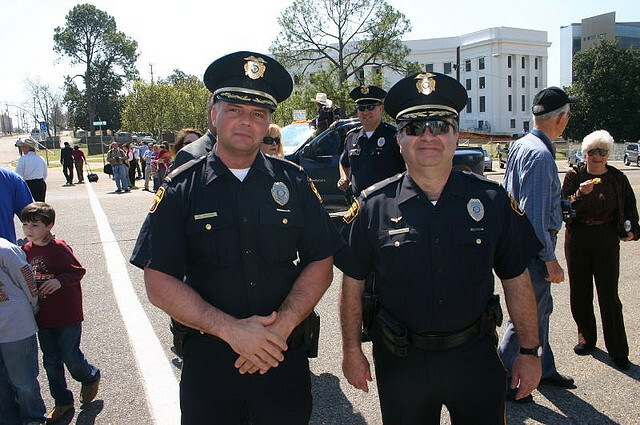 Alabama cops hope religion can help curb their city's skyrocketing murder rate. Billy Irvin, a popular Christian radio preacher, took the pulpit at Montgomery's City Hall on August 29 to address the city's murder rate. He talked about a documentary he had recently seen about young, wild elephants running amok who were tamed by an older elephant. Irvin was speaking at the graduation ceremony for Operation Good Shepherd, a publicly funded Christian outreach ministry started by the Montgomery Police Department that puts Christian pastors on crime scenes to counsel and pray with victims and witnesses. Police claim the program is a way to regain trust in the community, but there's another motive, which they aren't at all coy about: evangelism—they believe a stronger sense of Christianity will reduce crime. So far this year, 39 people people have been murdered in Montgomery, Alabama, the vast majority of them black. With a population of only 200,000, those numbers make Montgomery among the most violent cities per capita in the country. If the pace keeps up, 2013 will be the city’s most violent year in four decades. And if numbers specifically by race are taken into account, this could be one of the most violent years for Montgomery's black population since slavery ended. Nobody can pinpoint why the violence has increased. But in a city like Montgomery, there are a few common sense explanations: a weak economy; high unemployment rates in concentrated parts of the city (exacerbated by weak or absent public transportation); the third-highest incarceration rate in the country, which routinely makes it difficult on kids who have a parent in prison, thereby enabling them to repeat the cycle; severe cuts to the state's rehab and mental health clinics, which makes getting help with drug and alcohol addiction nearly impossible to obtain; the list goes on. But these weren't talked about during the Good Shepherd ceremony. Rather, Billy Irvin's wild elephant analogy was treated as both a diagnosis and a cure. If the police and pastors could be the wise elephants, crime would go down. “What we're seeing today, those seeds were sown a long time ago. I truly believe there has been a breakdown in the family. We have young people not being guided,” said Montgomery Police Chief Kevin Murphy. And Murphy's police department is intent on providing that guidance via a cop-led, Christian outreach program. “What we want to do is combine the religious community and the Montgomery Police Department and we want to unite those as one,” said Corp. David Hicks during an interview on Irvin's Christian radio program. Moreover, the department is frank about the evangelistic aspect of the program. It’s easy to see the appeal for the 37 pastors who graduated from the summer-long program and who will eventually be called to crime scenes. After all, their job is to preach, and they're being given a chance to reach individuals in extreme distress. But it’s not entirely clear that the program is legal, from the constitutional perspective. At the very least, Operation Good Shepherd, and the language around it, might understandably make First Amendment advocates nervous. The “outreach ministry” is entirely funded by taxpayers. Although the pastors are all volunteers who are not compensated by the city, police officers get paid their regular wages to train them and the program incurs administrative costs, including ID cards for pastors to get access to crime scenes. A second problem is that there is no evidence a program like this can have any effect on crime. Corp. Hicks, who created the program, said he did not consult any professionals for it. Rather, he based it on similar programs that were put into place in Dayton, Ohio and Arlington, Texas. However, those cities have not recorded data on the effect of those programs, so there's no indication they are a good idea to recreate. Police leaders of the program were called for comment on their personal opinion of the effectiveness of those programs, but none responded to voice messages. And two university criminologists in Dayton were contacted, but neither had ever heard of the program. When asked why he thinks a program like Operation Good Shepherd could work, Chief Murphy said he didn't know, but hoped it would. Dr. Earnest Blackshear, a professor of psychology at Alabama State University who has worked with Montgomery police on past programs, says he has lobbied for more scientific methods to finding solutions to Montgomery's murder problem, including a public health approach that would include psychological counseling and youth development programs. However, funding has been a roadblock – a common complaint among Alabama activists who say public health approaches to social problems are a better remedy. With Operation Good Shepherd, aside from some nominal administrative expenses from printing up diplomas and ID cards, the only cost involves redirecting police personnel--who are being paid anyway—from their other duties to train the pastors. Blackshear sees the idea of Operation Good Shepherd as a condescending attempt to recreate what Dr. Martin Luther King, Jr. did in the 1950s: use Christianity as a way to persuade Montgomery's black population to work towards a common goal. Despite the apparent ineffectiveness of Operation Good Shepherd, abstract, low-cost programs cloaked in prayer might be the one of the only tools at the Montgomery Police Department's disposal. With public services being cut everywhere, money for public health solutions like those that Blackshear wants to see implemented are unlikely to be seen for quite some time. As a result, even if no challenge emerges to Operation Good Shepherd’s legal status, the city may soon be facing an even more difficult situation. Unless putting pastors on crime scenes actually does reduce the murder rate in the city, police will be left with a more traditional approach: locking ever more people up. Alabama already has, along with third-highest gun violence rate in the nation, and the sixth-highest murder rate, the third-highest incarceration rate. Some lawmakers are already concerned about the sort of overcrowding that has gotten California in trouble with the federal courts. Ray Downs is a writer based in Montgomery, Alabama.